The CITY offers our laid-back take on the Chelsea Boot. Featuring our signature red stitching and a casual boxed toe, this boot can transition from day to night. The water-resistant waxed Portuguese leather ages handsomely, revealing a stunning patina over time, while the Vibram® half-sole and heel protector ensure the CITY will last season after season. 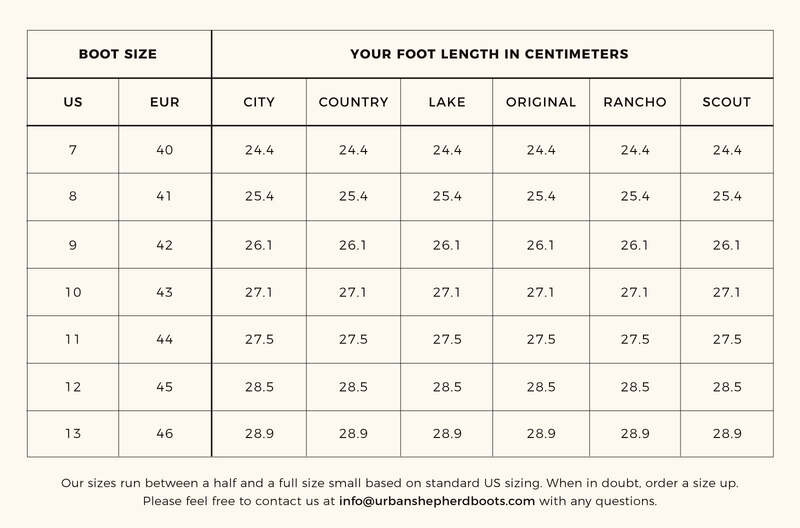 Like all Urban Shepherd Boots, the CITY is made with a genuine leather midsole and heel counter, hand-laid cork footbed, hand-shaped stacked leather heel and Genuine Goodyear Welt Construction, a durable welt process that allows our boots to be re-soled repeatedly.